By the end of this year, the world will have more than 2 million active smartphone users. South Korea will have around 39.6 million people with smartphones, with the number projected to swell to 43 million by 2021. Interestingly, South Korea is also has the highest smartphone penetration rate among all countries in the world, with a 2016 Pew Research Center report revealing that around 88% of South Korean households owned at least one smart device (Australia holds second spot; the world average (median) is ~43%). Among the younger generation (18-34), smartphone penetration is almost 100%, while among older people, the figure is in excess of 82%. Note: In terms of internet connectivity, the performance of South Korea is even more noteworthy, More than 99% households access the World Wide Web – through mobile, optical LAN, cable modem and other methods. In the United States, Android has a stranglehold over 66% of the market, with iOS registering a comparatively feeble 31% share. The picture is even more skewed in South Korea. By last month, the share of Android had grown to a whopping 78.9% in the country, while iOS accounted for a meager 20% of all new activations. Blackberry ranks a distant third with a market share of 0.23%, and LG, Windows and Samsung all have sub-0.2% share. The iOS vs Android market share stat in South Korea somewhat mirrors the worldwide figure (Android 73%; iOS 19%). The fast-growing South Korean telecommunications market has three major players – Korea Telecom (KT), LG U Plus and SK Telecom. Among these, SK Telecom, with 48% market share, easily holds the leadership position (although its growth has been tapering off as the market enters maturity) – while KT (31% share) and LG Telecom (21% share) holds the second and third spots respectively. In the telephone and fixed-line segment though, KT has the edge over its competitors. The arrival of 5G is set to drive mobile penetration levels to something in the region of 120% in 2018. The country also has the largest base of per capita broadband service adoption rate – with mobile broadband penetration touching the 110% mark in 2016. The total number of fixed broadband subscribers in South Korea is comfortably over 20 million. Note: The mobile broadband market has entered early maturity in South Korea, and the growth rates are likely to be more moderate over the next few years. On a YoY basis, time spent with mobile apps increased by 25% in 2017 Q1(worldwide). On the Android platform, South Korea has the highest ‘daily time with apps’ figure – with people using applications installed on their devices for close to 200 minutes every day (up from 180 minutes last year). Brazil, Mexico and Japan have the next-best app engagement figures, while the US ranks at a somewhat lowly 6th. On average, individuals use ~30 apps on their handsets every month (the figure is significantly lower than that in China). The app usage and retention figures are mostly at par with the global figures. 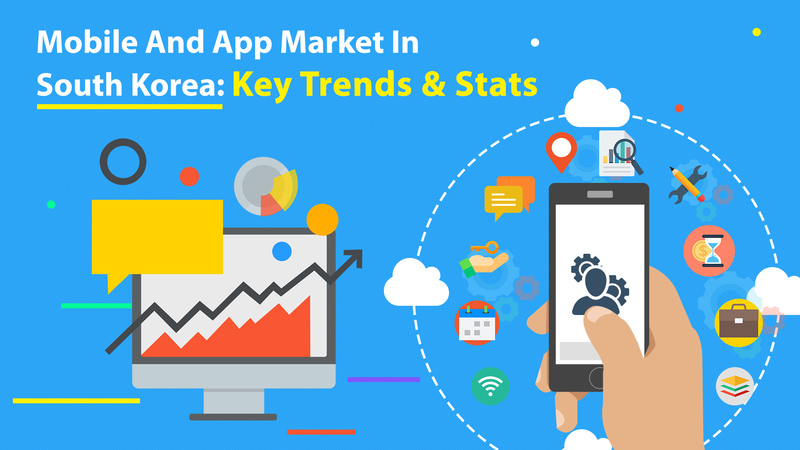 The lion’s share of apps in both Apple App Store and Google Play Store is free – and that is reflected in the extremely low cost per installation (CPI) figures of mobile apps in South Korea. Android is, expectedly, the ‘cheapest’ platform – with the CPI being only a shade over $0.60. On the other hand, the average CPI of iPhone apps and iPad apps are $.108 and $1.07 respectively. In the paid apps category, Gudak Cam ($0.99) holds the top spot (as on 10 October). In the free category of the Korean App Store, YouTube and Instagram both rank within the top-10, while Facebook is presently listed at the 13th spot. As in most other countries, ‘freemium apps’ (free with in-app purchases) is popular in South Korea too. South Korea has the 6th largest game industry in the world, in terms of revenues earned. The total spending on games hovers around $4.1 billion, with the total number of gamers in the country shooting up this year to nearly 26 million. However, only 1 out every 3 gamers in the country play games on all the three platforms (mobile, PC, console). On the mobile platform in particular, 45% of gamers (on SK Telecom) actually spend money on gaming apps. Once again, South Korea has the best engagement figure (on Android) – with more than 80 minutes being spent by the average user per day while playing games (beating out Japan, where the daily time-spent-on-mobile-games stat is around 73 minutes). United States, with users playing games for 32-33 minutes daily, holds the fourth position in this list. Note: The bulk of mobile app revenues come in from game applications (to the tune of 75%). Given the sheer volume of gamers and the high-engagement times, there are excellent earning opportunities for professional game developers here. The 2018 Winter Olympics will be held at PyeongChang in February, and KT Telecom has targeted the event for the rollout of their 5G services. Many new services and mobile capabilities are expected to be showcased to a large global platform (commercial availability of 5G worldwide is not expected till 2020). According to early reports, the 5G connections in South Korea will be up to ‘1000 times faster’ than the existing 4G services. Also, South Korea has the distinction of having the very first commercial interconnected VoLTE service in the world. KT, SK Telecom and LG U Plus had collaborated to release this service in the country. Earlier this year, 5C, or five-band carrier aggregation was also tested successfully in South Korea (by SK Telecom). The mobile gaming market is huge in South Korea, and the market for fitness applications is pretty big as well. The annual growth rate in revenues from fitness apps between 2016-2021 is estimated to remain steady at around 10% – with $93 million likely to be generated by this category by the end of 2021 (up from $45 million in 2016). More than 7 million people will use fitness apps by the turn of this decade, and the ARPU (average revenue per user) will be ~$13. It can be reasonably expected that fitness apps will continue to grow at a healthy clip for the next 3-4 years or so. Note: Samsung (41.9% market share) and Apple (20.3% market share) are the leading mobile and tablet device vendors in the country. A DMC Media report in end-2016 showed that Facebook was the most ‘engaging’ (time spent with the app) social media app in South Korea, among users in the 19-59 age bracket. However, in terms of unique users – local players like Band (14.9%) and KakaoStory (13.7%) are both ranked above FB (~10%). Among the nationwide Android users, KakaoTalk is the top-ranked smartphone application, while Band and Facebook are at 7th and 8th positions respectively. Interestingly though, businesses and corporate houses in South Korea prefer using Facebook over any other social media application. Within a relatively short span of time, the internet of things (IoT) market in South Korea has come a long way. In July 2015, Nokia Networks and KT had come together to start the country’s first IoT Lab – focused on bringing the ‘smart programmable world’ to users. The technology has advanced quickly indeed, and South Korea bagged the top spot in the ‘Asia-Pacific IoT Readiness Index’ of 2017 (Singapore and New Zealand take up the next two slots). The country has excellent investment opportunities for IoT vendors and OEMs – with the favourable business environment being a key factor. The fact that spending on IoT amounts to a significant percentage of South Korea’s GDP is indicative of the rapid development of ‘connected things’ here. The time spent with mobile apps might be high (particularly for games) – but apparently, users over here prefer using more or less the same set of apps. A recent report by Adjust revealed that an alarming 85% of South Korean applications are not discoverable by organic search – and are hence relegated to the category of zombie apps. The problem clearly does not lie in the native apps of the country (which makes up the 2nd smallest app marketplace here) – but with the broader pool of apps that are created for the global market. The onus is firmly on third-party mobile app developers in South Korea to come up with newer, better apps – that would have better chances of becoming popular. At the moment, low download figures are hurting many South Korean mobile apps badly. In May 2016, Samsung entered into a contract with SK Telecom to create the first commercial LoRaWAN-powered IoT network (at Daegu). The 900 MHz frequency band was used for the rollout of this technology – with the focus firmly on building automated, smart infrastructure for a wide range of things, right from cloud services and big data management for the medical sector, to renewable energy management and usage in connected cars. Within three months, the nationwide deployment of LoRaWAN network was done. At present, 99% of the country is covered by the network – and various smart city projects have been planned. Apart from Songdo (the country’s first smart city), smart applications are being built for several other cities. Note: The South Korean Land and Housing Corporation was requested by India in April 2017, to build a smart city in Maharashtra (‘New Kalyan Smart City’). This consolidated Korea’s position as a leading provider of smart-cities-as-a-service (SCaaS). Among the Asian markets, South Korea is right at the top in terms of smartphone penetration and the average count of installed apps. What’s more, smart innovations (adoption of IoT, LoRaWAN, etc.) are driving the country forward – and South Korea is in a good position to remain one of leaders in the mobile and app industry over the foreseeable future.